The message was loud and clear: a genuinely transformative approach to placemaking must invest in people as well as places. 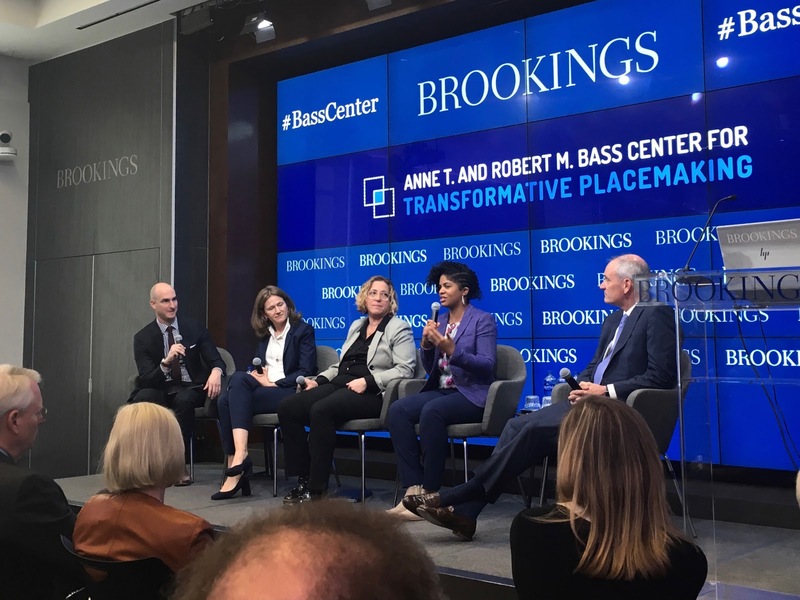 That was the big takeaway from the launch of The Anne T. and Robert M. Bass Center for Transformative Placemaking at the Brookings Institution earlier this month. A collaboration between Project for Public Spaces, the National Main Street Center, and the Metropolitan Policy Program at Brookings, the Bass Center will inspire public private and civic sector leaders to make transformative placemaking investments that generate widespread social and economic benefits. Coletta went on to explain the many tactical decisions regarding staffing, programming, and design that placemakers must pursue in order to foster social mixing in public space. “Managing for mixing requires a bundle of small precision moves that are more error than trial.” But she maintained that this difficult work is both necessary and possible—if the United States chooses to invest in social infrastructure to the same degree that it invests in roads, rails, and utilities. Jennifer Vey, Director of the Bass Center for Transformative Placemaking, explores the intertwined histories of place and economy in the United States. Jennifer Vey, the new director of the Bass Center, took a step back to examine the ongoing story of placemaking and working life in the United States. “The changing relationship between place and economy has created the very patterns of concentration, dispersion and segregation that mark our cities today,” said Vey. Today, this relationship continues to evolve, as new demands for urban attributes are affecting different places in different ways. Some economically booming urban employment areas, like the Innovation District in Chattanooga, TN must grapple with the threat of gentrification and learn to pull their weight in addressing economic inequality in the city at large, while many more urban neighborhoods like Bronzeville in Chicago, IL must fight against disinvestment and population loss, since they have not seen the benefits of the recent flood of investment in city centers. Rural towns like Newcastle, WY aim to diversify their often extraction-based economies and take advantage of their unique character, while aging suburban office parks like Columbia Gateway in Columbia, MD hope to retain choosy white-collar workers and the companies that chase them by reinventing themselves as urban oases. In sum, Vey emphasized, if we hope to invent new ways for placemaking to support people’s access to employment, education, and entrepreneurship, we must first understand the ways that our diverse physical and social environments have shaped the geography of opportunity in the United States. An interdisciplinary panel at the launch of the Bass Center was moderated by Adie Tomer (left), leader of the Metropolitan Infrastructure Initiative at Brookings, and included (from left to right) Patrice Frey, Director of the National Main Street Center; Elissa Gertler, Director, Planning and Development at Metro in Portland, OR; Shauen Pearce, Director of economic Development and Inclusion Policy for the City of Minneapolis; and Robert Stewart, Executive Vice Chairman of JBG SMITH Properties in Washington, DC. The launch concluded with a discussion between an interdisciplinary panel. Early on, Shauen Pearce, Director of Economic Development and Inclusion Policy for the City of Minneapolis, challenged the audience to see placemaking through an expanded lens: “The policies and procedures that have caused our country to get to its current state,” she observed, “Those were actually acts of placemaking. It was placemaking to decide who could go where. It was placemaking to decide that black and brown people could not have permits in their own city.” For Pearce, placemaking must answer the question of who gets to participate in, contribute to, and benefit from the public realm. The problem of lack of capital is one that spans the urban-rural divide. Patrice Frey, Director of the National Main Street Center, observed, “It is extraordinarily challenging to get small deals done in rural America, and small deals are all there are.” Big banks rarely show interest in either of these markets, and the number of local banks and credit unions have dwindled, especially since the Great Recession. Without more small and diverse sources of capital, people face severe limits in how they can participate privately in the placemaking process, and build wealth when investment does come, rather than being forced out. The panelists identified affordable housing as yet another way in which the private life and public space intersect. Both Frey and Gertler discussed the importance of making integrated investments in affordable housing, infrastructure and the public realm. Although rural places receive generous federal funds for housing, Frey explained, the strings attached to that money make it hard to build additional housing downtown and make the most of other social, physical, and economic investments. Conversely, as Metro Portland has revisited its investments in light rail around the region, they are increasingly treating the surrounding neighborhoods as “investment areas,” which wrap those infrastructure investments with equitable development strategies, like building affordable housing, stabilizing businesses, and leveraging investment with private dollars. Robert Stewart, Executive Vice Chairman of JBG SMITH Properties in Washington, DC, also highlighted a new model of creating subsidized housing. Stewart argued that traditional strategies like public housing, housing vouchers, and inclusionary zoning are all rather expensive sources of low-income housing that also tend to concentrate poverty or exacerbate gentrification. Instead, JBG SMITH and others have created a nonprofit that purchases existing units in gentrifying neighborhoods to create subsidized housing, a far more inexpensive way to provide affordable housing, which promotes income diversity and provides low-income residents with access to more urban resources and amenities. In all cases, the panelists demonstrated how urban housing supplies that have failed to keep up with population growth, as well as nearly a century of pent up demand for walkable urban places, has made it increasingly important to consider investments in the public realm and investments in affordable housing together. The creation of Sundance Square transformed a surface parking lot into the heart of a vital new mixed-use district in downtwon Fort Worth, TX. 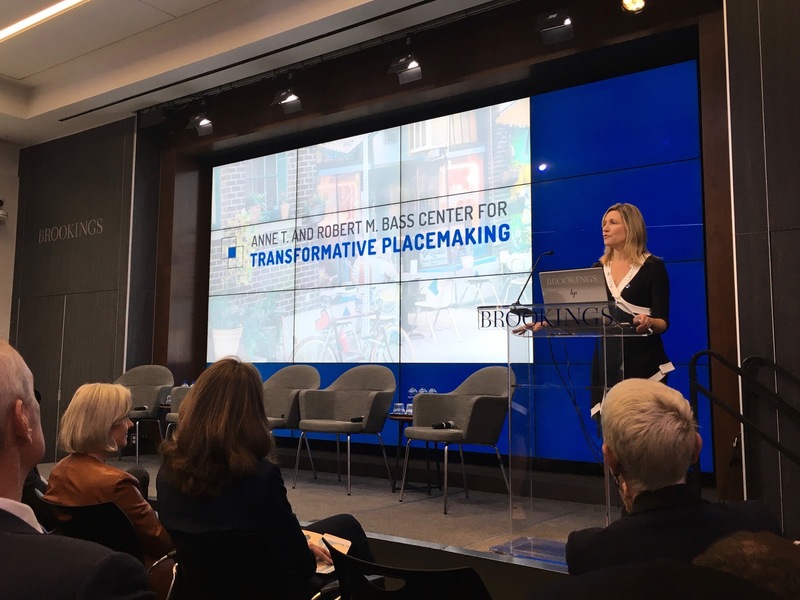 The research and projects undertaken by the Bass Center for Transformative Placemaking promise to provide a firm reminder that every public space designer, decision-maker, and manager should post somewhere in their workspace: Placemaking is not about stuff. When public, private, and civic leaders invest in placemaking, the results will be shallow if they see it as nothing more than laying out chairs and tables in the town square to attract upscale outsiders. Placemaking that leads to a truly transformative impact is always an investment in the capacity of a community to change, grow, and enrich both the people and the places in its care.